On July 15, 2007, then Paris Mayor Bertrand Delanoë opened 10,600 bikes in 750 self-service rental stations to Parisians and the world. For only €1 ($1.14 US) a day, one could take unlimited rides of 30 minutes each or less. It seemed to be a transportation revolution. Vélib' success made the world embrace self-service public bicycles. but its notoriety changed the world. In 2007 there were only around 20 self-service public use bicycle programs throughout the world. Now ten years later, there are over 1,350. Many of them are direct copies of the JCDecaux design and function seen in Vélib'. What at first might have seemed a curiosity, automated self-service bicycle rental has turned into a social phenomenon. 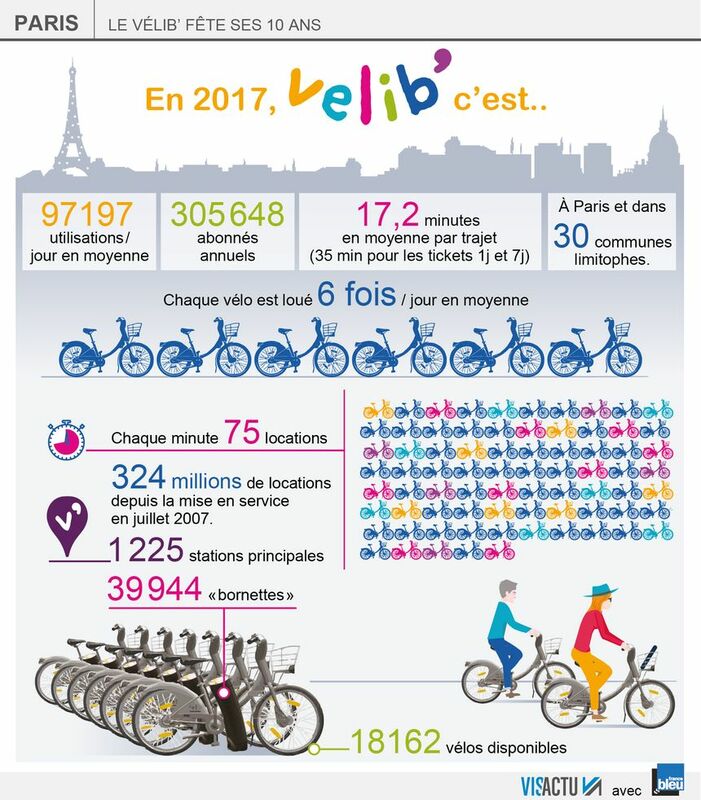 According to JCDecaux, the current operator of Vélib', every minute 75 Vélib' bikes are rented in Paris. On average each bike is used about 6 times a day. In the last 10 years over 300,000,000 trips were pedaled on Vélib'. Now, there are 300,000 annual subscribers to the system in the City of Lights. January 2018 will bring, Vélib’ 2.0, with a new design, a new service, and a new operator: the Smoovengo consortium will replace JCDecaux. It will introduce what Smoovengo bills as the "4th generation" in self-service bicycles. This will include 30% of the fleet as electric assisted pedelecs. The maximum speed for the electric assist pedelecs will be set at 25 km/h (15.5 mph). Weighing 20.6 kg (45 lbs.) the regular pedal new Vélib’ will be "lighter and stronger" than the old one at 22.7 kg (50 lbs.). The new "padlock fork will help prevent theft" from stations and while parking away from stations. 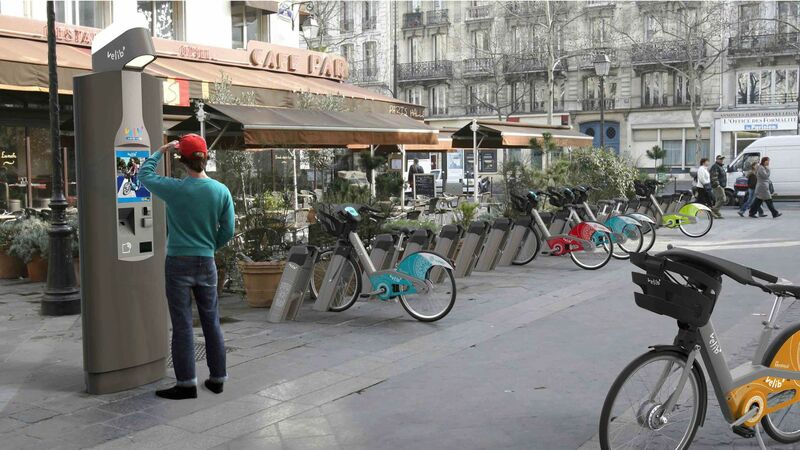 To abate the annoyance of Parisians, who have found stations full when returning a bike, the system of will allow "depositing bikes at a station even when all the places are already occupied". Each bike will have "embedded electronics" with a handlebar equipped with an on-board communication system (the Smoove Box) that is self-powered by a dynamo that will allow connecting a smartphone for way-finding and information. Congratulations to Vélib', the old and the new. Keep in touch with The Bike-sharing World with The Bike-sharing World Map. It is the premiere resource for information on Public Use Bicycle programs and a complement to The Bike-sharing Blog. The map can be viewed at www.bikesharingmap.com.